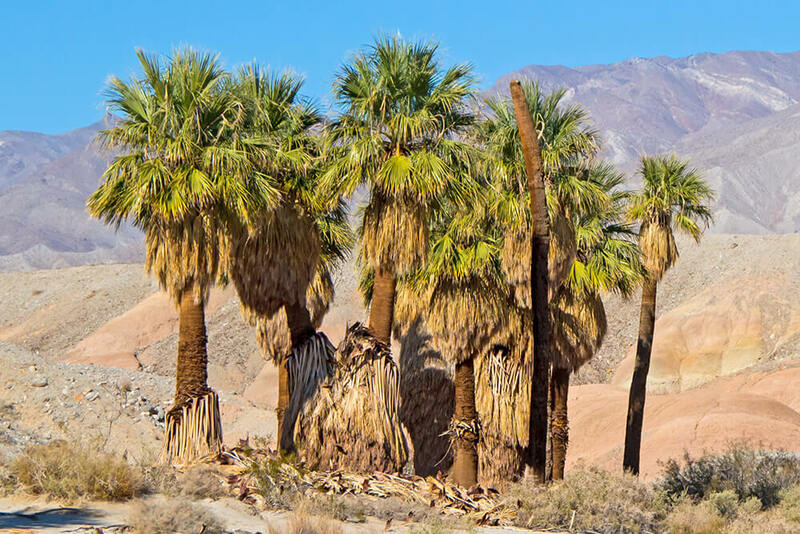 Native to deserts of the southwestern US and Baja California, Mexico, California fan palms cluster around year-round sources of water: streams, springs, and seeps. They are the only palm species native to the western US, where they tolerate hot summer and freezing winter temperatures. They provide shade and shelter, habitat for animals including canyon tree frogs Hyla arenicolor, Pacific chorus frogs Pseudacris regilla, Baja ratsnakes Bogertophis rosaliae, western yellow bats Lasiurus xanthinus, and many species of birds. Their fruits ripen and drop in winter, providing food for coyotes Canis latrans, which are important seed disseminators for these palms. California fan palms grow best full sun, with good drainage. They are a good choice for California gardens in dry areas with moderately alkaline soils. Indigenous people of North America used leaf fibers for making baskets and sandals. Entire leaves were sometimes used for thatching. In California, hooded orioles use this palm's unraveling leaf fibers to make nests, sometimes using the fibers to "sew" their suspended nest onto a palm frond. Notice this plant's Latin name: Washingtonia filifera. It was named in honor of our first president, George Washington, and for its fibrous leaf tips, which give the plant a wispy appearance (filifera means "having fern-like leaves"). See California fan palms thriving at the Safari Park in the Nativescapes Garden and the Baja Garden, in World Gardens.